So I certainly could have taken a better picture of this, but I did my best. Really, I did. I’ll have to make these again during the daytime when the lighting is better. I was craving something different and stumbled upon some pins on Pinterest saying that Paleo Swedish Meatballs was a thing. Skeptical as I was, I did some digging, went through our cabinets, made a quick trip to the grocery store, and voila! 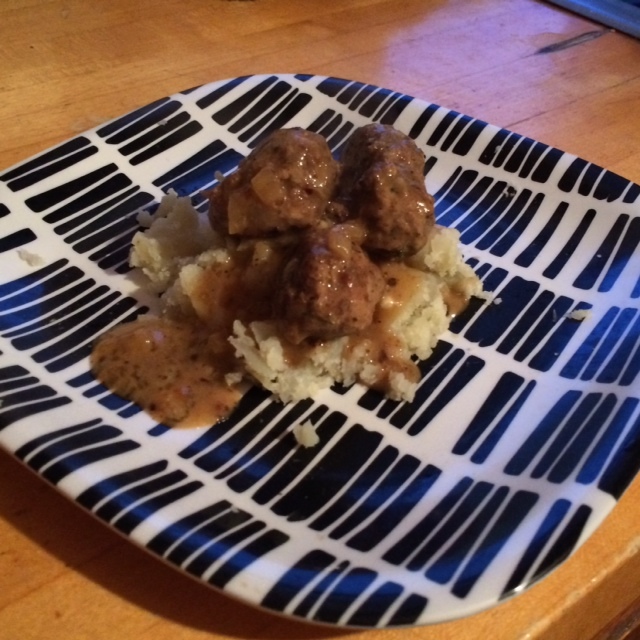 I created Paleo Swedish Meatballs. For meatballs, combine beef, pork, egg yolks, and seasonings in a large bowl. In a medium sized skillet on medium heat, cook onion and garlic in your choice of cooking fat. Cook for 5-7 minutes until carmelized. Add to meat and combine everything. Form 1-inch sized balls, and cook in the same skillet you used to cook onions and garlic. Cook for 8-10 minutes, continuously rotating each ball, until browned. You can do this in batches, depending on the size of your pan. Remove balls and set aside. In the same skillet, add onions. Cook for about 4 minutes. Add coconut milk, ghee/butter, water, and pepper. Whisk and cook for about 5 minutes on medium-high heat. Slowly add tapioca flour, one tablespoon at a time, whisking thoroughly. If it clumps, you can move to a blender, but be aware of how hot the liquid is. Bring to a low boil, and cook until thickened. Add salt to taste, then add meatballs to the sauce. Serve over a baked or mashed potatoes.